Your holiday base is the 4* Playamarina Hotel on Punta del Moral on Isla Canela in Spain, just over the Portuguese border. There are guided walks in the Natural Park area of the Donana, the Flecha del Rompido Nature Reserve and a walk and boat trip along the banks of the Rio Guadiana. In your free time you can relax and enjoy the surroundings of your hotel or take an optional excursion to the Rio Tinto mines. ecosystem and feeds the marshes in both countries. Local flora and fauna is always a major attraction of any walk, and, given the abundance of birdlife in the area, one of the walks majors on the birdlife of the Rio Piedras. Days Two to Seven: In resort with three included guided walks. There is plenty to do in your free time. The front of the hotel looks across to the thriving fishing village and marina of Punta del Moral. You can have a pleasant stroll around the harbour or take a little ferry ride across to Isla Cristina. There is also a short signed-posted walk near the hotel into the Isla Canela ‘Marismas’ (marshes). The rear of the hotel backs on to the promenade from where there are wooden boardwalks across the dunes to the beach and the sea which provide a heavenly environment for your morning constitutional. Walking past the inviting chiringuito (beach bar) might be difficult! 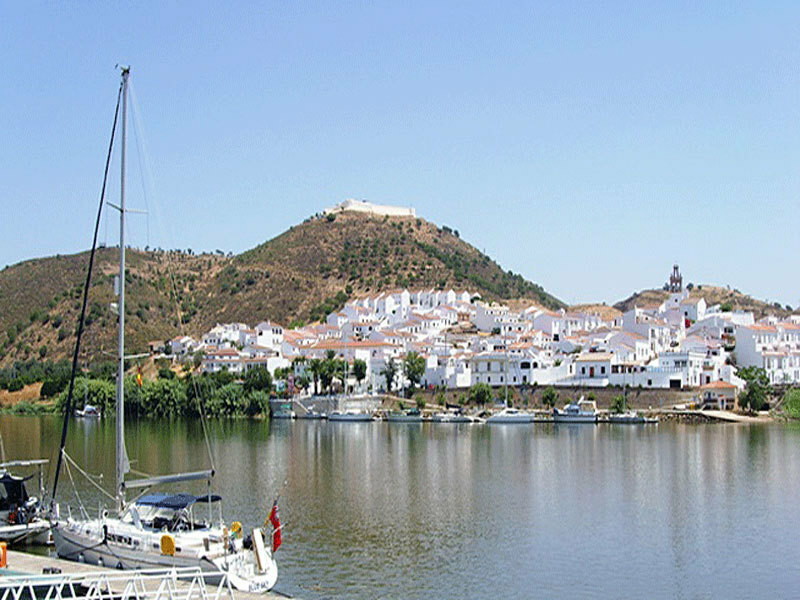 There is a frequent bus service which makes the 5 mile journey to Ayamonte on the Guadiana river. Ayamonte is a bustling ‘frontier’ town with a compact old centre, marina and port. The ‘frontier’ is the river and for under 3 euros you can get a return ferry across to the pretty town of Vila Real de San Antonio in Portugal. If you can find the time, a complimentary 1 ½ hour circuit of the hotel’s extensive spa facilities is included for you! Walk 1: Donana & El Rocio. Travel east by coach past Huelva to the start of your walk in the Natural Park area of the Donana (67 miles). This walk is through pinewoods across the dunes to the sea – but dunes here aren’t quite what you think! They are ancient sand deposits rising to 100m offering great views of the sea and the pine forests behind. Just over 4 miles with ascent/descent of 75m. You then travel to the strange town of El Rocio (15 miles away), which seems like something out of the Tex-Mex West, with clapboard houses, sand covered squares and avenues and rails to tie your horse to! But this is no tourist movie set – in fact it is a major pilgrimage site. Your walking guide will take you on a short walk featuring the major sites of this fascinating town and there is free time for lunch here before returning to your hotel. Walk 2: The Rio Piedras and Flecha del Rompido Nature Reserve. 30 mile transfer to the beginning of your walk. You will need your binoculars today. You visit the marshes of El Rompido doing a level walk through the pinewood, the salt marsh and a fish farm. The area is full of birds and wildflowers and the headland where the lighthouse is located offers one of the most beautiful views of the estuary. This part is 2.8 miles and ends in the attractive fishing village of El Rompido where there is free time for lunch. In the afternoon you take a ferry trip across to the 10-mile sandspit of El Rompido where several protected species live on the dunes in a special ecosystem: among others Stone Curlew, Kentish Plover, Dartford Warbler and the European Chameleon. This part of the walk is 3.2 miles and ends in El Terron. Walk 3: Alcoutim & the Guadiana River. We head across the river by coach to Portugal and north to Alcoutim (33 miles).The picturesque river town of Alcoutim has a Spanish twin right on the other side, Sanlucar de Guadiana. The circular walk goes along the river´s edge using the “Via Algarviana”, a trail that crosses the whole Algarve and then through reforested pine wood and Mediterranean oaks. 5.3 miles and ascent/ descent about 150m. You have time to visit the castle in Alcoutim and lunch before taking a lazy 3 hour boat cruise down the beautiful Guadiana river to Ayamonte. During your stay in Isla Canela there is also an optional excursion to the Rio Tinto Mines. There has been mining in the hills 80 miles north-east of Isla Canela for over 5000 years. In the museum in the town of Rio Tinto there is an excellent re-creation of the Roman mine. There is British influence in many parts of Spain but nowhere as pronounced than in this remote corner of Andalucia. The pinnacle of mining in the area began in 1873 with the arrival of the British Rio Tinto Mining Company Ltd who paid £3.68 million for the rights to exploit the disused copper mines. The company employed up to 20,000 men, laid 300km of rail track, built houses for employees and management, a protestant church and a Social Club which had a cricket team and introduced football to Spain. The museum is housed in the company’s hospital and its offices are now the town hall. Highlight of the tour is the rail journey through the open cast mines where you’ll see an amazing ‘Martian’ landscape with the red (bright red!) Rio Tinto river running through it. An excellent hotel in a quiet position located between the beach and the marina on Punta del Moral. The hotel has a buffet restaurant with show cooking, indoor and outdoor pool. There is also a spa (a free 1 ½ circuit is included for you), bar and entertainment on most evenings. Rooms have bath with shower over and separate shower and wc, hairdryer, LCD tv, air-conditioning, ceiling fan and safe (chargeable), terrace or balcony. Free Wi-Fi in reception (30 mins) – chargeable in room.